Perfectly situated on the second floor of the world famous department store; Harrods away from the busy first floor is the brand new Godiva Chocolate Café. For those of you who are not familiar with the name Godiva; the luxury chocolate brand first opened its doors in 1926 and has since then been a universally recognised and benchmarked producer of the finest Belgium Chocolates. In light of Godiva’s fabulous reputation and products alongside such a premier location we thought this would be something truly special. From the moment you approach the entrance to the Chocolate Café it is almost impossible to not be captivated by the intoxicating smell of fresh chocolate or to find your eyes being drawn to the beautiful chocolates, pastries or even fresh crepes and waffles being created. The start of our Godiva Chocolate Café experience was unfortunately regrettable from the onset. As we were led through the beautiful café, our waiter initially offered us a table that he admitted was wobbly, and therefore not fit for purpose. Almost taken aback by such an offer we declined that table and instead suggested another seat. Regaining our optimism, we looked through the menu and once again fell in love with the vast array of delicious options we could select from! The menu contents range from bakery products including the following pain au chocolat, triple chocolate muffins and the delectable Belgium waffles. Also included in the menu were selections of pastries including Raspberry cheesecake, chocolate hazelnut delice and seasonal fruit tarts. The most extravagant items on the menu range from a Godiva afternoon tea to numerous chocolate fondues. In-light of our surrounds and caught up in the excitement decided to be incredibly indulgent and select the classic chocolate fondue with ice cream milkshakes. However; despite the Café not being anywhere near full capacity we waited nearly twenty minutes for our order to be taken, we were then offered no apology or explanation as our order was speedily taken. Unfortunately, our bad luck continued as we continued to wait for a considerable time period for our order; which in-turn had a detrimental effect on our initial buzz of being in such a location. When the milkshakes finally arrived, they looked beautiful. 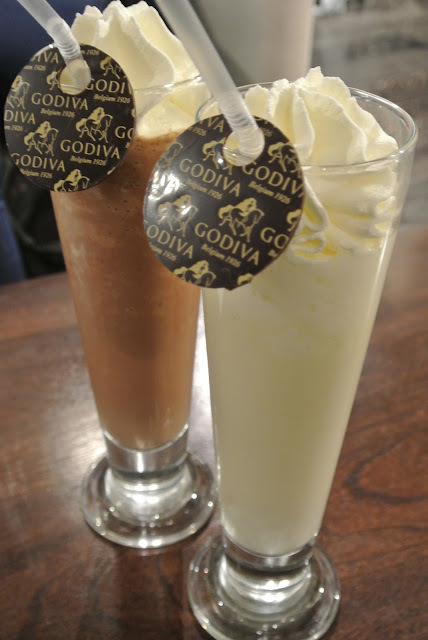 The ice cream milkshakes were in elegant tall glasses, with a signature Godiva chocolate label resting on the straws of each. Kate’s milk chocolate ice cream milkshake was truly spectacular with a rich, intense taste. My white chocolate ice cream milkshake was rather annoyingly (in light of the time frame I had waited for it) made incorrectly, with the ice cream notably missing. I raised this fault within seconds of sipping from it; my compliant however was ignored numerous times. Gesturing to a third waitress I raised my concern. The waitress was not impressed with my compliant to put it lightly, and took the milkshake back to the bar. After some very unprofessional obvious scornful looks and protest I was given another milkshake made correctly; however due to her actions I felt very uncomfortable from that point within the chocolate café. 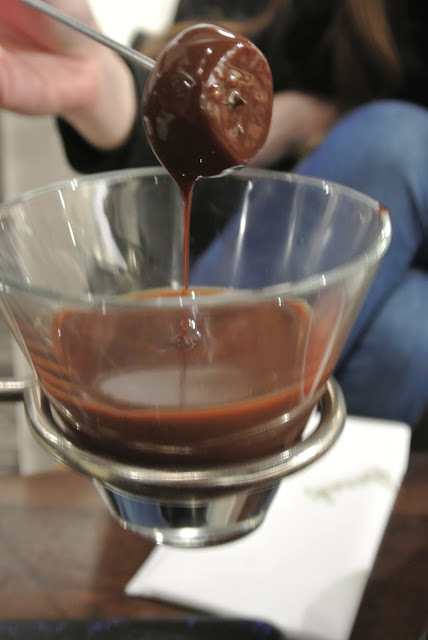 We hoped that the chocolate fondue would recover our experience so far; but alas this was to not be the case. The initial item for the chocolate fondue was similar to a piece of apparatus you would find within a school chemistry class and seriously lacked the glamorous, Harrods touch that of course you are paying premium for. Once again the service was painfully slow; and had zero customer care as it was presented to us. The Chocolate fondue consisted of the following items to dip in our chocolate pot: pieces of fresh banana, strawberries, croissant and mini marshmallows. We mutually agreed that the chocolate fondue was painfully average in appearance and taste for the sum we paid, and we both expected more. In all honesty, the Godiva Chocolate Bar did not meet our expectations and the behaviour of certain staff members only further ratified that in light of the hefty bill there are much better locations to relax and indulge.